When the photos of the S90 first surfaced on the internet, I was about to take off on a flight. So apart from a few pictures that I could download before going offline, I didn't have access to any other information about the car. Therefore I also had no hint that it was to replace the ageing the S80 sedan. The '90' in the badging told me that it was the new flagship sedan for the brand and it seemed like it would be slotted above or at least on par with XC90. After all, it wore such a beautiful design draped on a lengthy saloon bodywork. I had discussed Volvo's new design language with some experts and designers from other brands when we all witnessed the XC90 at the Paris Motor Show in 2014. The beautiful XC coupe concept had been put into production, virtually unchanged. The 'Thor's Hammer' headlights looked great and the clean minimalist lines were a bold statement in today's age of flame surfacing and radical fluidic curves. 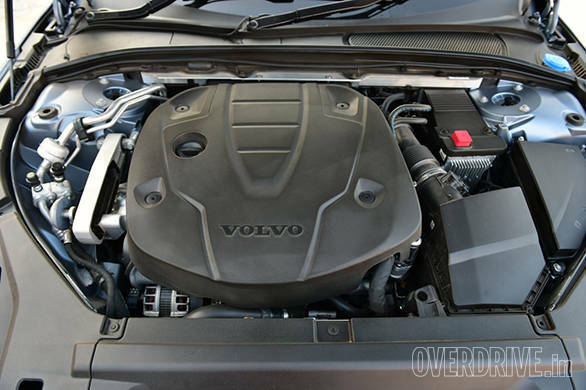 While all of us appreciated this new direction at Volvo, most of us hoped it doesn't end up joining the same path taken by Mercedes-Benz, Audi, BMW or Jaguar - where every member of their model line has such a strong familial resemblance that the entire portfolio ends up looking the same, save for the different body styles. 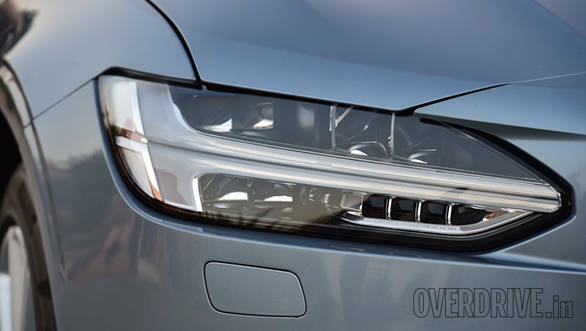 The headlights on the S90 immediately reminded me of that concern. Now that I have actually spent some time with the S90, I believe that this design won't get diluted even after the S60 and V40 lines adopt the new design language. 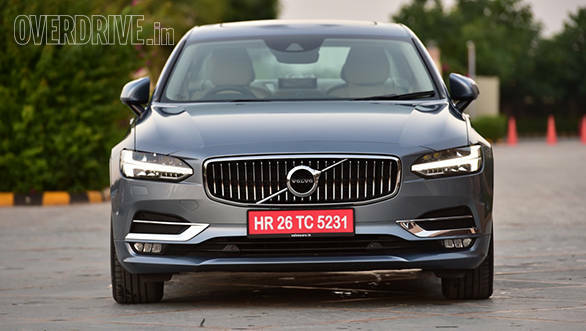 That is partly because some of the design details like concave grille, the indentation for the Volvo insignia on the boot the and distinctive shape of the taillights are all exclusive to the S90; and the other reason is the sheer length of the S90 which makes it so imposing and also makes it the longest car in its class. It's hard to digest the fact that the class in question is that of the A6, E-Class, XF or the 5 Series. 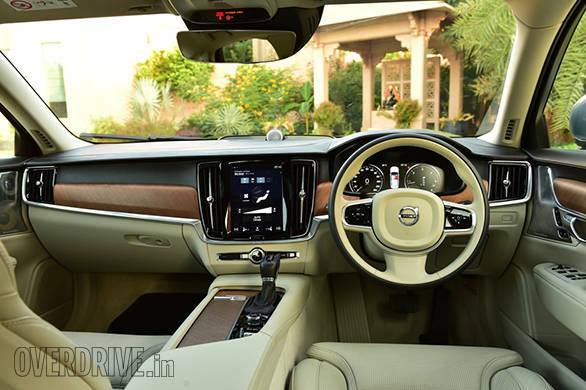 The long bonnet is is necessitated by the SPA platform that the S90 shares with the XC90, where the distance between the front axle and the dashboard is fixed. But the S90 uses the limitation to its advantage. The long bonnet, the chunky taillights and the the straight lines of the car remind me of the stately cars from the 90s. But the generous use of LEDS, the finishing of the paint, the smooth contours, the diamond cut alloys and the attention to the minutest of details - all make it a 21st century car. That said, it isn't a modern retro, but more of a timeless style done right. Think of it as tuxedo that is tailor made to fit you, prim and proper. In that sense, the design doesn't necessarily bring anything remarkably new to the segment, but the sophistication sets it apart. It looks beautiful it's own way and to me it isn't trumped by any other car in its segment - the E-Class already looks too much like C; the new 5 Series lacks flair; the new XF lacks novelty; and the new A4 and Q5 makes me believe that the A6 won't look too different than the current model. The story is no different on the inside either. The familiar, minimalist design from the XC90 is refined further to suit the cabin of the S90. There is heady mix of metal and wood on the Inscription trim that I was driving around. The R Design trim that could join in later will replace the classy wood inlays with materials like carbonfibre or aluminium, which are synonymous with sportier styling. The materials feel premium and the cabin feels rich and plush. There's plenty of attention to detail on the inside too - like the knurled finish for the knobs, the little Swedish flags in the upholstery and the patent stamping on the seat belts reminding those in the know that Volvo invented the three-point seatbelt back in 1959. The vertical infotainment screen cuts the switchgear clutter and displays a multitude of data at once, meaning that you don't need to navigate through too many menus to access various information. It's complemented further by the digital instrumentation and the head-up display which show the more immediately relevant data like navigation or telephony information. The user interface isn't perfect and will need refinement, but I like where its headed. The slim front seats look like foam pads cobbled up together on a spine but Volvo says that these are designed and developed in collaboration with orthopaedics to ensure clinically safe ergonomics and enhanced safety in case of an accident. The seats also come with their own little crumple zone underneath to prevent spinal injury from occurring in case the car suffers a massive underbody impact. The comfort levels of the seats are indeed very good and the ventilated surface adds more to that effect. The cushioning seems firmer than its rivals but offers better long distance comfort. Ditto for the rear seat. There is plenty of room in the back to approve of the S90 as a chauffeur driven car. Under-thigh support could have been better, but I appreciate the tall seat back as it offers excellent support for the shoulders and neck. Despite the S90's long, low-slung design and the coupe roofline, getting in and out of the car is surprisingly easy. The cabin has excellent noise insulation too and the only thing that frequently broke the silence was the air-conditioning system that was working hard in the Rajasthani heat. 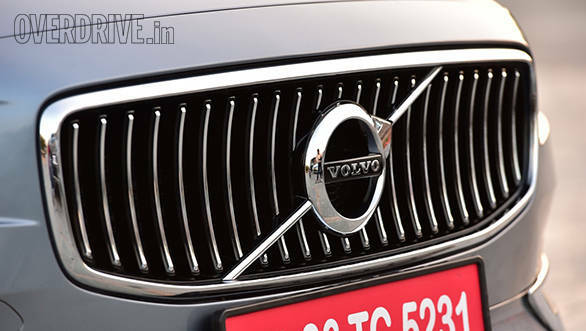 The new Volvo sedan begins its stint in India with the D4 diesel engine - a 1969cc oil burner that has humble power and torque outputs, but comparable to the other 2.0l units from its rivals. The engine is quite a refined operator and the power delivery is quite linear. Unlike it's more powerful D5 sibling that we sampled in Europe a few months back, this one doesn't get the 'power-pulse' compressed air technology that claims to eliminate turbo lag. But frankly it doesn't seem to need one. There is enough low end shove for casual urban duties as well as highway runs and in our two days with the car, the engine never struggled even at lower revs. Overtakes at city or highway speeds aren't a problem either and the engine builds up pace quite briskly despite its relaxed nature. Contributing to that cause is also the eight-speed Aisin gearbox which we have appreciated in the past too. It is quick to respond to throttle and brake inputs and the operation is butter smooth. The chassis and drivetrain also come with three preset driving modes to choose from - Eco, Comfort and Dynamic - and as the names suggest, these will alter engine and gearbox responses and the dynamism of the chassis and suspension. But don't expect its Mercedes-Benz parring comfort mode to turn into a 5 Series challenging dynamic mode. In fact, apart for the change in engine response, there is very little change in the behavior of the standard-fit air-suspension or moderately weighted steering. This car likes to remain supple and comfortable. Though Volvo has managed to make a headway into getting radar guided assistance systems to India, sadly those will ship only with the XC90 T8 for now. 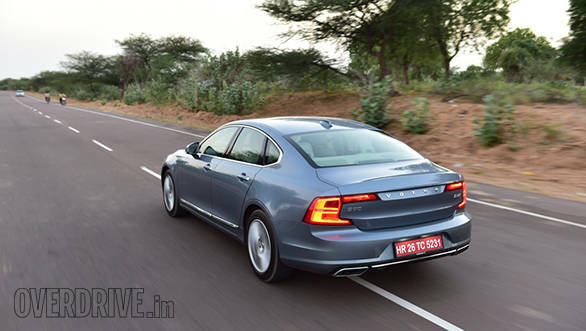 The S90 D5, which comes to India in 2017 will get most of it too. The S90 does get the lane keep assist though which will automatically input a steering response if your car starts deviating out of its lane. It works with a set of cameras that identify the lane markings on the road to maintain the ideal path. As expected, the system isn't fool proof, thanks to the inconsistent road surfaces and the lack of visible markings on most of our streets. Nevertheless it's a nice system to have and comes standard with the S90. When it works, it could seem intrusive at times if you want to make sudden overtakes or lane changes as the steering tries to pull you back into your lane. But pull the maneuver responsibly by indicating the turn blinkers and then giving the steering input and the system won't intrude. It's a nice lesson in driving ethics. Apart from this system the Volvo S90 doesn't really do anything new than the current segment dwellers. But it does everything just right, leaving no room for complaint. It will come to India in the Inscription trim to begin with and apart from a couple of upholstery options and eight exterior colours to choose from, there isn't a hassling options list to get confused over. Expected to be priced between Rs 54-57 lakh (ex-showroom) it sounds like quite a sensible package for the kit and the design it offers. Should the Germans be worried? Not too much, at least in India, given their higher brand following. 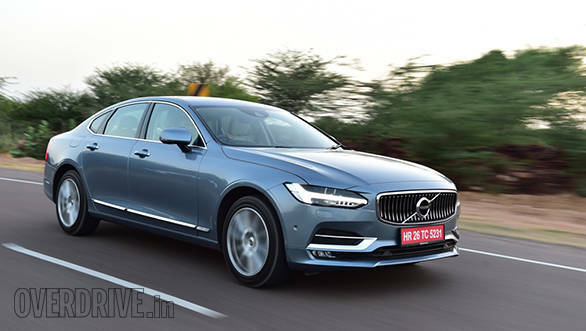 But for the increasing number of consumers in this segment, for whom exclusivity matters more than make and model, the S90 looks like a better alternative to the new Jag.